If you are looking for a sailboat with a two ton HVAC unit and a one ton porcelain potty, then stop right here. 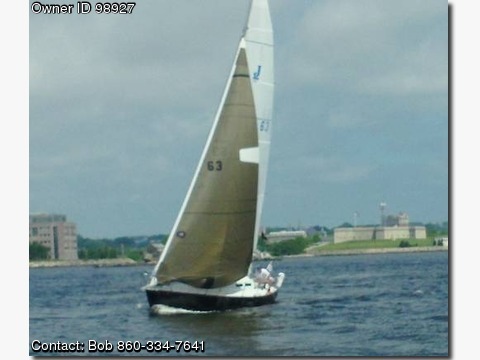 The J30 is known as one of the best all around performance sailboats to ever come out of the Johnstone Yachts Stable. The fractional rig design makes sail trim easy and the light weight, rugged hull has certainly withstood the test of time. The 20 hp Yanmar Diesel is a tested workhorse for those windless afternoons and this one was rebuilt 4 years ago. There is a full inventory of sails including , #1, #2 and #3 Headsails as well as three Spinnakers and Main . The J30 has 4 berths that sleep 4 comfortably, a Head, Nav Station and a Galley as well. Most Importantly, if you enjoy a cockpit shower consisting of a Random Rainstorm and a Cooler that is limited only by the amount of your friends filling it, then this J30 is for you! This J30 is in good condition. The Yanmar Diesel engine was rebuilt 4 years ago. There is a complete inventory of running rigging including: Spinnaker Sheets and Guys, Jib Sheets, Main Sheet, Halyards, Vang, Cunningham etc. The standing Rigging is a Kenyon Spar and Boom (Aluminum). The Outboard Rudder and Martek Folding Prop were rrefurbished a few years ago.